Home > Market News > Has Oil Supply Lost Its Balance? Has Oil Supply Lost Its Balance? Oil prices plummeted nearly $2/bbl yesterday, as geopolitical risk factors such as the Saudi-Iran conflict have cooled (for now) and production numbers pointing to rising supply. Stock markets and oil both fell in unison in response to on-going concerns with U.S.-China trade. After giving up nearly 3% yesterday, crude prices have halted the losses and trended slightly positive, picking up 18 cents to trade at $63.19. Fuel prices also took a big hit, with diesel falling 2.4% and gasoline giving up 2.6%. Today, both are working to stay in positive territory. Diesel prices are $1.9808, just a hair above yesterday’s closing price. Gasoline prices are $1.9797, picking up 1.4 cents (0.7%). Yesterday, China slapped tariffs on $3 bn worth of goods imported from the U.S., a response to Trump’s steel and aluminum tariff and his threats of further tariffs on $60 bn of goods. The response from China was relatively mild compared to Trump’s threat. China and the U.S. have ongoing trade talks to help resolve the tension. Markets fear that if trade talks were to break down, the situation could escalate to a trade war between the two largest economies in the world, which would put a huge dampener on economic (and oil) demand. 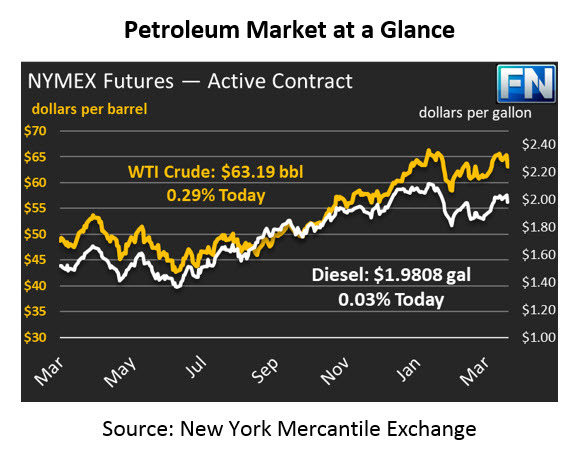 The major threat to demand was a major contributor to yesterday’s declining oil prices. On the other side of the equation, supply statistics point towards rising global production. Russian oil output rose to an 11-month high in March, and Saudi Arabia is reportedly cutting oil prices to Asian buyers, a sign of more supply going to the market. While neither of these headlines in a vacuum would have huge impact on markets, markets are highly focused on supply/demand trends currently. With markets roughly balanced, a slowdown in demand (à la trade war) mixed with rising production could tip markets towards oversupply and plummeting prices. Of course, in the background is on-going concerns over the Iran nuclear deal. The U.S. has made clear the deal is unlikely to continue as is. With the deadline for sanction waivers approaching on May 12, markets will likely revert soon to reapplying a risk premium to crude prices. Sanctions could be applied to Iran’s oil exports, taking supplies off the market. Even if sanctions don’t apply to oil, markets may still avoid buying Iranian oil due to the threat of future sanctions, which would cause prices to rise.